Palmetto Health Richland is a state of the art medical facility, located in Columbia, South Carolina. It is one of the largest and most progressive hospitals in the Southeast and is designated as one of only four Level 1Trauma Centers in the State. 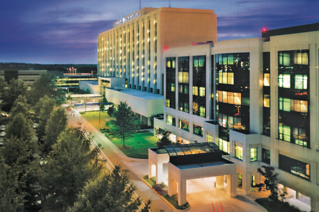 Palmetto Health Richland provides in-patient and out-patient services at its Columbia campus, which includes Palmetto Richland Memorial Hospital, Children’s Hospital and Heart Hospital. These hospitals and the other buildings on the campus are equipped with a card-based access control system that controls entry and exit activity to restricted or sensitive areas. The card system is also used for access to general employee areas, equipment closets, telecom rooms, IT closets and more. A set of master access control keys allow entry to any of the areas secured by the card access system and the hospital’s Security Services is responsible for provisioning these master keys. Keeping track of who has issued a master key and when/where it was used or returned had become a significant security issue for the hospital. According to Henry Simons, Director of Security and Volunteer Services for Palmetto Health, both engineering and security were stakeholders in the operational process but neither had an effective procedure for controlling or monitoring the master keys. Mr. Simons’ search for a key control and management solution led him directly to Morse Watchmans, a company with whom he was already familiar. Morse Watchmans PowerCheck® Guard Tour System with its multiple tour capabilities, integrated functions and reporting options was in place as an established element of the hospital’s security operation. The Guard Tour System works with stations that are set up around the facility; as the officer walks by with the Guard Tour handheld device, the system reads and records the time. The device can be programmed to prompt either sequential or random tours for the officers, and the officer can enter a standardized code at any station to report incidents instantly. To resolve the hospital’s key control and management issues, Palmetto Health Richland selected the Morse Watchmans KeyWatcher® key control system for installation in the security and engineering departments. The system safely stores the master keys and automatically records the access history of each transaction, including user, date and time of checkout/return. The KeyWatcher cabinet can only be opened by individuals who have been pre-programmed into the system. To open the cabinet and access a key, the individual enters their authorized code and swipes their card access identification badge on the built-in proximity reader. By releasing assigned keys only to users with the proper authorization code and permission, accountability is ensured, along with safekeeping and integrity of the master keys. Palmetto Health Richland is continually growing and expanding its services and Mr. Simons fully expects that the Morse Watchmans KeyWatcher system will grow right along with them.